Suffolk County Crime Stoppers and Second Precinct Crime Section officers are seeking the public’s help to identify and locate the man who stole clothing from a Huntington Station store last month. Huntington Station, NY - September 20th, 2013 - Suffolk County Crime Stoppers and Second Precinct Crime Section officers are seeking the public’s help to identify and locate the man who stole clothing from a Huntington Station store last month. 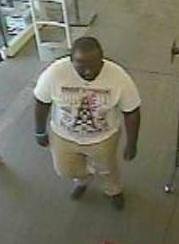 A man entered Old Navy, located at 839-114 New York Ave., stole several pairs of jeans and shirts and then fled the parking lot in a red Chevrolet Malibu on August 20 at approximately 2 p.m.
Subject: LongIsland.com - Your Name sent you Article details of "SCPD Crime Alert: Wanted for Petit Larceny"